Fifty years ago the Mercedes-Benz Universal, a station wagon built in Belgium by Benz contractor IMA, made its debut. The Universal was based on Mercedes’ 200 D and 230 S fintail sedans and boasted a split rear-seat backrest, a self-leveling rear suspension and an optional third row — all ahead of their time. Even with those innovations, Benz only sold 2, 754 of them, putting a bullet in the poor thing’s head after 1968. Undaunted, Mercedes tried the wagon idea again in 1978, launching the Wagon 123. This time, the idea took: Well over a million E-Class station wagons have been built, and, especially here in the U.S., their blend of elegance and practicality have helped them carve out their own niche. As Benz notes, U.S. E-Class Wagon buyers have among the “most affluent customer profiles of any vehicle in the Mercedes-Benz portfolio, ” joining the S-Class Coupe as Mercedes-Benz USA’s demographic leader. So next spring a new E-Class wagon arrives: the E400 4Matic Wagon, based on the E sedan launched six months ago. Mercedes’ 3.0-liter twin-turbo V6 powers the wagon, producing 329 hp and 354 lb-ft with the new 9G-TRONIC nine-speed automatic transmission standard. So is all-wheel drive, as the name implies. Like the E-Class sedan, the new wagon’s long hood, steep rear window and short overhangs make it look more modern and dynamic than the outgoing car. The higher beltline makes the ’17 look stretched — it’s also an inch longer and an inch lower overall. The interior is straight-up E sedan, so fit and finish is among the best in all of automobiledom with rich woods and excellent fit and finish. Where it diverts from the sedan, of course, is the Wagon’s standard third-row folding bench seat — yup, the E400 seats seven! 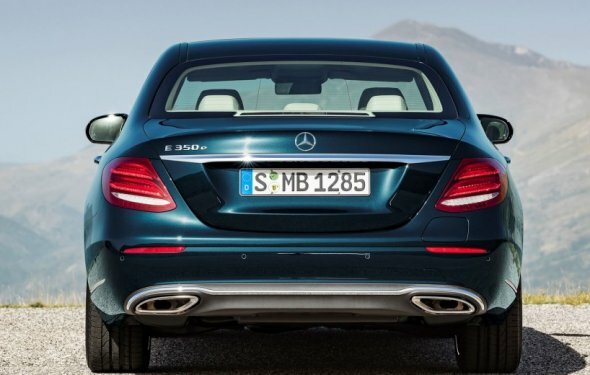 Rather like an E300 sedan with an 88-hp boost, which is in fact the case. The turbo-six is strong and combines with the nine-speed for some real oomph when needed. The trans is smooth when you’re not really legging it and changes gears fairly quickly the harder the car is pushed. Benz hasn’t released a 0-60 time, but we’re guessing it should arrive in about 5.5 seconds, while the 130-mph top speed is electronically limited. Mercedes-Benz It holds seven people, and the third row seat folds flat. In other words, set the speed and off the wagon goes. With zero driver input, the car stays in its own lane on straight roads and slices smoothly through corners, adjusting speed as needed depending on what’s happening ahead. Drive Pilot can also change lanes when commanded. Turn on the turn signal, wait two seconds while the cameras and radar look around and then the car glides smoothly over to the next lane. Every once in a while the system beeps, reminding you to retake the wheel. All that aside, we can say the latest Benz wagon is among the quietest cars we can recall, good for longer hauls. Mercedes added bracing in the floor and body shell to help stiffen the chassis, as well as more sound insulation in the floor and sides, and installed sound absorbers under the rear seats and in the wheel arches. It also added seals on the windows, door handles and door hinges. Mission accomplished. As you know, crossovers big, small and in between are taking over the car world — we’ve written that till we’re blue in the face. For those of you who just don’t want one, here’s a practical, stylish, lovely driving alternative. Kudos to Mercedes for sticking with it. Curb Weight: 4, 500 lbs.